WHEN DO TICKETS GO ONSALE AND HOW MUCH ARE THEY? Tickets go on sale early January each year. Club Gisborne Outlets: Sequence, BMS and Blitz Surf shops in Gisborne. If you're unsure about the validity of a ticket you are purchasing, please check with our customer services team before exchanging any money. Limited single day tickets are released in August each year depending on capacity. This gives you single day access to the festival either December 29th, December 30th or December 31st. You won’t be able to access the campgrounds on a single day pass. WHY DO I HAVE TO PUT MY NAME ON THE TICKET? As an extended security measure, each ticket is required to have the name of the individual attending. Staff will check the ID matches the ticketholder at the festival check-in. WHAT HAPPENS IF I MISSPELL MY NAME ON MY TICKET? Contact Customer Services as soon as possible, provide your order number and the correct spelling of your name. We will fix it for you as a courtesy (if you ask nicely of course). I CAN’T MAKE IT ANYMORE. DO YOU OFFER REFUNDS? No, unfortunately! You can sell your ticket how you wish till July 1 2019 and change the name of the ticketholder through your Universe account - it is important that the correct ticketholders name is on the ticket. You can sell your ticket how you wish until July 2019 and change the name of the ticket holderthrough your Universe account. Please note to ensure the validity of the ticket, we require the name on each ticket to match the name of the ticketholder. At the event, security will be checking to ensure the name on the ticket matches the name of the ticketholder’s ID. However due to opportunists re-selling fake tickets or tickets at inflated prices, we have teamed up with TIXEL as our exclusive resale partner to reduce harm caused by illegal ticket scammers and greedy ticket scalpers. If you can no longer attend and need to sell your ticket after July 1, you can do this through Tixel, the official resale facility. If you want to buy a ticket but none are available, you can sign up to notifications so you’ll be the first to know when certain tickets become available. The only way to buy a secondhand ticket that is reissued in your name is through TIXEL. We will be checking that ID’s match the name on each ticket at the door. Please note to ensure the validity of the ticket, we require the name on each ticket to match the name of the ticketholder. At the event, security will be checking to ensure the name on the ticket matches the name of the ticketholder’s ID. If you need to sell or change the name on your ticket after July 1, please note that name transfer fees apply. You can change names on the ticket for free up until June 30 by logging into your Universe account. For more information on ticket resales and name changes, head here. I NEED A COPY OF MY TICKET, SO HOW DO I GET ONE? If you have purchased a ticket to Rhythm and Vines, your ticket will be in your Universe account. If the ticket isn’t in there, it is likely to be under a different email address, or most commonly you have entered in the wrong email address when purchasing. Please contact our customer service team who will aim to get this fixed for you. WHAT DOES MY 3 DAY GENERAL ADMISSION PASS GET ME? A 3 Day General Admission Pass does NOT include camping and you will have to buy this seperately ($100 for a regular camping details). For more information, see camping FAQ's below. I WANT TO PURCHASE TICKETS FOR MY GROUP OF FRIENDS HOWEVER NOT SURE OF THEIR DETAILS OR IF THEY’RE ALL COMING. HOW CAN I GET AROUND THIS? We strongly recommend having all the details of your friends and making sure they are all attending the festival before purchasing tickets as there are no refunds. However, if you purchase a ticket for a friend and you spell their name wrong you can fix this through your Universe account. If they wish to pass that ticket onto someone else, you or your friend will have to transfer the name on that ticket via Universe. If the name change occurs after July 1 - there will be another solution, but there will most likely be fees involved. Yes, you can purchase up to two tickets under one account. This is to reduce ticket scalping and to reduce other issues with multiple ticket purchases. Contact Universe directly. Should you not hear back from them, contact us here and we can look into it from our end. I’M HAVING ISSUES WITH MY TICKET RESALE ON THE TIXEL WEBSITE? Contact Tixel directly. Should you not hear back from them, don’t hesitate to contact us as well and we can look into it from our end. I’M HAVING ISSUES WITH MY R&V AMBASSADOR TICKETS ON THE VERVE WEBSITE? Contact Verve directly. Should you not hear back from them, don’t hesitate to contact us as well and we can look into it from our end. WHAT IS A VINTAGE CLUB PREMIUM PASS? A Vintage Club Premium Pass does NOT include Camping. WHAT CAMPING IS AVAILABLE AND HOW MUCH? Camping amongst the vines at Rhythm & Vines is an experience like no other. Everyone who purchases a valid camping pass gains access to 4 days camping for $100 ($25 per day). Campground facilities include portaloo toilets, camping shower blocks, shaded seating areas, camp stores, garden bars and food courts. All our campgrounds are located onsite, all within a very short walk from all the festival stages. Bass Camp is located within our beautiful Waiohika Campgrounds on Waiohika Estate, conveniently on the doorstep of the festival itself. Situated within the vines, Bass Camp is the first campsite to sell out (as early as January). Bass Camp is also home to the popular Hubs, see below for more information. Mid Camp is located within our beautiful Waiohika Campgrounds on Waiohika Estate, directly behind the main Vines Stage. Situated within the vines, Mid Camp sells out as early as January. Treble Camp is the festival’s largest campground. Situated within the vines, Treble Camp is the closest campground to the main carpark of the festival and only 5mins walk to get from your tent through to the festival gates. They don’t call it Trouble Camp for nothing. Sundown Camp is our second largest campground located right next to Treble Camp. Easy access to the carpark and less than a five minute walk to the festival gates. Rhythm Camp is our smallest camping zone, nestled within the vines between Cellar Stage and Rhythm Stage. Meadow Camp is tucked in behind the Rhythm Stage. An open field camping experience, Meadow Camp is our final campground released to public. Premium Camp is located opposite Sundown Camp but offers a more refined camping product, with a limited capacity and access to more modern camping facilities such as showers and toilets. All Premium Campers get the additional benefit of Vintage Club Premium access once in the festival itself. Tepee Village is located within the Premium Camp zone and offers access to the Premium camping facilities. Tepees are pre-setup, and sold in 2 Person and 6 Person packages (inc Tickets). Read more about Tepee Village under Packages below. Glamping Village is located within the Premium Camp zone and offers access to the Premium camping facilities. Glamping tents are large pre-setup Bell Tents, sold as 2 Person and 4 Person packages (inc Tickets). Read more about Glamping Village under Packages below. Prem-Tent Village is located within the Premium Camp zone and offers access to the Premium camping facilities. Prem-Tents are pre-setup canvas tents sold as a 2 Person package (inc Tickets). Read more about Prem-Tent Village under Packages below. Hub Village is located within Bass Camp zone which is a general camping area (i.e. don’t have access to Premium Camp facilities or Vintage Club VIP included within the ticket). Hubs are pre-setup sold as packages which come in 2 Person Deluxe or Essentials (includes Tickets). Read more about Hub Village under Packages below. HOW DO I CHANGE CAMPSITES? Rhythm and Vines will be operating a TICKET SWAP system that will allow you to waitlist to swap tickets with person's wishing to swap campgrounds. However, we encourage you to purchase your camping ticket at the same time as your friends to ensure you get into the correct zone. Fees apply for Ticket Swaps. Therefore, it is important that you buy early to get into your favourite campground. These changes have been made to ensure we have enough infrastructure in place at each campground, providing the ultimate camping experience. NOTE: Tickets are being sold through Universe this year and information is subject to change & will be updated accordingly. All campers are required to bring their own tents (and take them away). Unless of course, you have purchased one of our Packages which are pre-setup for you (Tepee, Glamping, Prem-Tent, Hubs). WHAT ARE THE OPENING TIMES FOR ONSITE CAMPING? Onsite camping will open for check-in at 9am on December 28 and you must vacate by 4pm on January 1. Please note organisers reserve the right to alter these times. Entry gate is Gate D. This will be clearly signposted. Park your car in the car park and proceed to the Camping Check-in Tent (signposted). This is where you will receive your wristband for Onsite Camping. You can then proceed to your campground. You sure can! This is part of the attraction of the Onsite Camping experience. If you want to get away from it all for a break or a quick lie down, you’re only minutes away from your tent. Please note that due to the conditions of our license there will be a one-way door at midnight on the 29th and 30th, and then at 2:30am on the 31st - i.e. once you leave the festival site after these hours you won’t be allowed back in. CAN I VISIT MY FRIENDS AT THE OTHER CAMPGROUNDS? You will still be able to visit friends once the festival is operating, however, you do run the risk of getting blocked from entry into the various campsite should you not have the correct campground wristband. General campers can not visit Premium Camp, Tepee, Glamping, or Prem-Tent Village, which are exclusive to holders of Premium Camp wristbands. MY FRIENDS ARE STAYING IN A CAMPGROUND THAT IS SOLD OUT. I DON’T WANT TO SLEEP BY MYSELF IN ANOTHER CAMPGROUND. WHAT ARE MY OPTIONS? In order to improve the customer experience and campsite loading (ensuring we have right number of showers, toilets etc), there will be some changes made to R&V Onsite Camping at the 2019 festival. This year you will be required to have the appropriate camping wristband in order to set up your campsite with your friends. For example, if your friends are staying in Treble Camp, and you have a Meadow Camp wristband, you won't be able to set your tent up in Treble Camp. CAN I BRING ALCOHOL INTO THE CAMPSITES? The Festival bars located within the festival site open from 2pm each day from December 29th. CAN I BRING FOOD AND NON ALCOHOLIC DRINKS INTO THE CAMPSITES? You can bring a reasonable quantity of snacks / food that doesn’t require cooking and unopened non-alcoholic canned drinks (limited to six per person). Due to our sustainability efforts and licensing, full plastic bottles/water containers won't be allowed through security so please don't bring these with you. You may bring in with you EMPTY bottles or water containers into the festival. There are a number of FREE water refill stations located across the festival site. There are plenty of food vendors and bars have a wide range of non-alcoholic drink options available for sale also. Camelpaks are allowed but will require frequent searches by security and must be empty when passing through security checks. WHAT TYPE OF BEDDING CAN I BRING? Foam mattresses are not permitted as they pose a potential fire hazard. Air mattresses and camping rolls are best suited to the onsite camping environment. IS THERE POWER AT THE CAMPSITES? No, the camping sites are not powered. Rhythm and Vines operates accommodation packages for Tepee, Glamping, Perm-Tent, Hubs, Hotels and Motels. Each accommodation option includes tickets within the package. This is a fun & classy way to get your festival ticket and accomodation sorted all at the same time. You can purchase a package via the Rhythm and Vines website. Each package includes tickets to Rhythm and Vines built into the cost. If you already have your 3 Day GA Festival Pass, and wish to upgrade to a package (which includes tickets), we can refund your initial tickets purchased once you purchase the package. When buying the package, you will be prompted to enter in the Universe order number for your initial ticket. Our Premium Services team will then process the refund of the initial ticket and reissue you with your new package ticket. We are selling tickets through Universe this year so this information is subject to change. More details to come later. The ultimate eco-friendly camping experience run by our partners Tepee Life. The handmade Tepees are created from recycled corporate advertising banners, giving each one a unique look and feel. A stay in the Tepee Life village gives you a whole new festival camping experience. Phone charging access through the Tepee Life onsite office. All Tepee packages include the added benefits of Vintage Club Premium at the festival such as access to the Vintage Club VIP bar, viewing platforms, priority queues and more. The real buzz is the Tepee Village as a whole - a community of like-minded festival peeps, a home away from home that you’ll always remember, with an eco edge to boot. Remember to pack some wild and fruity outfits and other essentials such as torch, sunblock, togs & towel, great attitude and a smile on your dial. All Glamping packages include the added benefits of Vintage Club Premium at the festival such as access to the Vintage Club VIP bar, viewing platforms, priority queues and more. Air mattresses, which you can choose 1 double OR 2 singles. All Prem-Tent packages include the added benefits of Vintage Club Premium at the festival, such as access to the Vintage Club VIP bar, viewing platforms, priority queues and more. Cute little hubs provide you and your friend (or for yourself) with a cozy, covered double bed nestled on the hillside in Bass Camp. There are two types of Hubs - Essential and Deluxe. Deluxe Hubs include duvet, sheets, pillows for two, 2 x camp chairs and handy solar light. Essential hubs includes the essentials, which is the Hub and a double mattress. The Emerald Hotel Package is the top of the line R&V experience. Packages include Vintage Club Premium Passes, three nights accommodation at the 4 star Emerald Hotel, buffet breakfast, exclusive bus and pool party access. A range of packages are on offer, with accommodation at quality Gisborne motels and motor inns. Packages include Vintage Club Premium Passes, four or five nights accommodation (depending on the motel) and festival bus pass. Some motels have age limits. Please read descriptions carefully. A definitive highlight of Rhythm & Vines is the pool party scene at the Emerald Hotel. Three afternoons of pre-Rhythm poolside daze with top DJs spinning the sounds of summer. Have a drink, have a boogie, go for a swim. Then hop on the exclusive bus out to R&V. Limited $40 Tickets available to purchase. Include complimentary White Rhino and Red Bull Organics Cocktails upon arrival. Hosted by friends of the festival each day. The Pool Parties are held poolside at the Emerald Hotel, from midday till 5pm. Tickets are sold separately, and include bus transport to the festival. WHERE IS RHYTHM AND VINES? 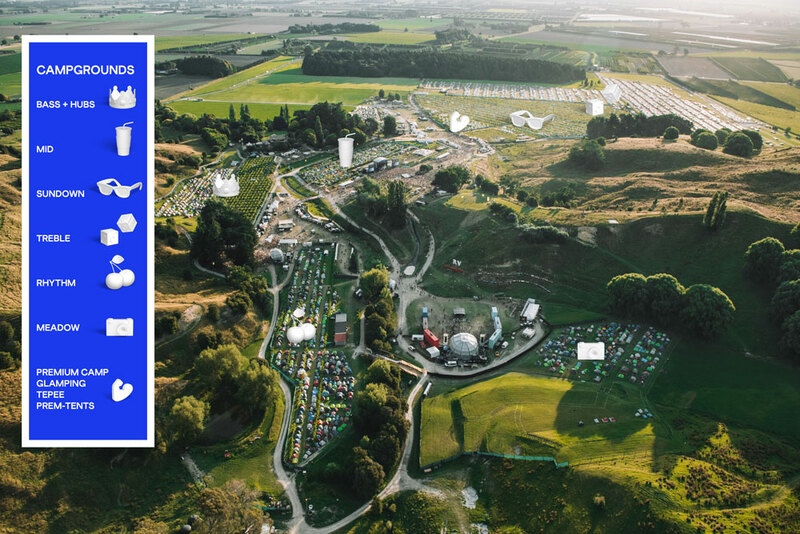 Rhythm & Vines is located on Waiohika Estate in the sunny town of Gisborne on the North Island’s east coast. WHEN IS RHYTHM AND VINES? The Rhythm and Vines camping opens up on the 28th December, with the festival officially starting at 2pm on December 29. The festival goes through until the early hours of 1st January, being the first festival in the world to welcome the first sunrise of the new year. See below dates and times. Please note organisers reserve the right to alter these times. WHEN IS THE LINEUP RELEASED? The first release of acts is usually announced after August, with a final release of acts in November. The festival hosts over 100 international and local artists each year in Gisborne. WHAT TIME DOES CHECK-IN OPEN AND CLOSE? HOW OLD DO I HAVE TO BE TO ATTEND R&V? Rhythm & Vines is strictly R-18. Anyone under this age will be denied entry. You must be 18 on the day you check in to R&V. For example (and unfortunately) if you are turning 18 on the 30th of December, then you will only be allowed entry on the 30th of Dec, not on the 29th. Overseas IDs, expired IDs, Student IDs, credit cards, birth certificates, library cards, gun licenses will NOT be accepted. If your ID is super old (can hardly see the photo), or you have completely changed your look - you will need to bring a secondary photo ID. DON’T go for your new Driver’s License if it is not 100% guaranteed to be ready before Rhythm. Think it through. If you’re the silly bugger who went out onto the town with your only form of photo ID and lost it right before R&V - then unfortunately that's a you problem and there's nothing we can do. All photo ID matters are legal issues - that means there is no wriggle room. Please don't waste your time begging us to let you in with a photo of your ID or asking to use another unoffical form of ID. Make sure you have this sorted so you don’t miss out on R&V this year! Be sure to remind your mates - no discretion. CAN I BRING ALCOHOL AND FOOD INSIDE THE RHYTHM & VINES FESTIVAL? Food and Alcohol is not permitted into the festival. There are a range of food and drink offerings available within the festival. You may bring in with you EMPTY bottles or water containers into the festival. There are a number of FREE water refill stations located across the festival site. Over 30 food vendors and bars have a wide range of non-alcoholic drink options available for sale also. Camelpaks are allowed, but will require frequent searches by security and must be empty when passing through security checks. WHAT OTHER ITEMS ARE NOT ALLOWED AT RHYTHM AND VINES? See below a list. Organisers reserve the right to restrict items deemed to be inappropriate in the festival environment. Illicit drugs or illegal substances. Mirrors larger than 10cm in diameter. BBQ’s or gas cookers of any description (this includes candles or naked flames). Material to construct fires or weapons. Inappropriate drinking apparatus, including funnels. Aerosols over 180ml (spray deodorent, hair products, body spray, etc). Medications including supplements - exceptions: standard pain relief in original packaging. Prescription medications must be accompanied by doctors script in bearers name, must be in original packaging, quantity only enough for the festival. Glass (including glass containers and/or drinking vessels). Exclusions are perfume bottles under 150ml and makeup under 60ml. WHERE DO I GO TO APPLY FOR A JOB/TO WORK WITH RHYTHM & VINES? For any jobs that may arise with Rhythm & Vines and for other application forms ranging from food vendors to performers, please head to our Apply for R&V page. Rhythm and Vines is located in Gisborne, on the East Coast of New Zealand’s North Island (Waiohika Estate, 75 Waimata Valley Rd). Once in Gisborne, you have the ability to park at the festival site, or you can catch one of our Festival Busses. Taxis will also be operating in Gisborne. If you are staying onsite, there will be FREE Shuttles each morning from 9am to take you into the Gisborne township. You can scan your ticket via your phone at the Bus Pick Up, or you are welcome to print it out (hint: tidy kiwi's bring your tickets on your phones). Buy from the 'Tickets' section on the site or click here. Buses will drop patrons upon request along the designated bus route, providing it is safe to do so. HOW DO I GET TO R&V FROM MY HOTEL OR MOTEL? If you have purchased an R&V Hotel or Motel Package, a Festival Bus Pass will be included. Other options are purchasing a bus pass. I'M STAYING ONSITE - HOW DO I GET INTO TOWN? I'M BUSSING INTO THE FESTIVAL - WHERE CAN I LEAVE MY CAR? For those bussing into the site and looking for somewhere to leave their car, Gisborne has several car parks available. Click here for more information on these. You can use Cash, EFTPOS or a credit card to load money onto your R&V wristband. Everything is paid for within the festival via an electronic RFID chip (AWOP) which is located on your wristband. The wristband will be given to you when you check-in to the festival. Stations will be located all over the festival for you to top up as well as refund any money remaining. AWOP (Another Way of Payment) is a festival bank system Rhythm and Vines uses to keep the event cashless. This helps minimize queues at the bars and improves access control. You can top up your wristband with cash or via Eftpos, Visa or MasterCard at the onsite Top-Up booths (Festival Banks). The first time you top up your electronic wristband there will be a once off service fee of $5. The maximum top up at any one time is $300. Any on site purchases will be made by scanning your AWOP chip and will deduct funds from your account. At various locations across the festival site. The exact locations will be released closer to the festival, but don't worry about queues as there will be PLENTY AWOP stations all over the site. WHAT IF I HAVE MONEY LEFT ON MY AWOP? Refund booths will be operating at the R&V Onsite camping on January 1st. Refunds are also available from the AWOP site until January 31st. Head to the AWOP website to organize your refund. Check the details on the back of the RFID chip on the wristband, as you will need to provide the Chip Number to get your refund.